Wolds Glamping in Pocklington, York, East Yorkshire, offers stunning glamping accommodation in a charming location. 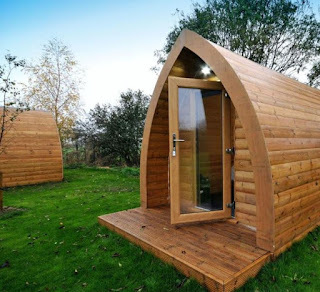 The pods offer a touch of luxury whilst still feeling close to nature. 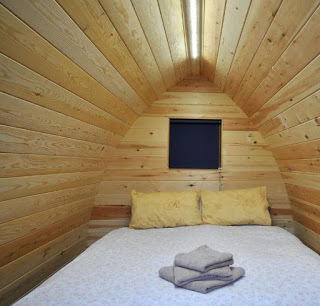 There are six pods in total and all have electric heating, LED lighting, electric sockets for mobile phone recharging and pine beds. The windows and doors are double glazed to keep you warm and toasty in the colder months. The pods can accommodate three beds, and a travel cot can be provided. Two beds can be joined to make a king size bed. The shower block has 3 individual showers, toilets and washbasins. Attached to the shower block there is a galley kitchen where visitors have use of a microwave, fridge, kettle and hair dryer. Outside is a BBQ and table and chairs are provided - ideal for a spot of al fresco dining. Wolds Glamping is in walking distance of Pocklington where there are many superb restaurants and shops. Pocklington is well known for welcoming walkers and cyclists. The Wolds are ideal for all to tour on foot or bicycle. Visitors can enjoy fantastic views over the Wolds, the East Riding is known for its “Big Sky”, on a clear day the Pennines can be seen from one direction and from another Flamborough Lighthouse.